Today, Oct. 22, the United States Mint is accepting orders for sets of circulating quality 2015 Presidential $1 Coins. Buying options include a set with dollars from the Denver Mint and bearing ‘D’ mint marks and another one with dollars from the Philadelphia Mint having ‘P mint marks. Presidential $1 Coins kicked off in 2007 but four-coin sets of them debuted just three years ago. The U.S. Mint in late 2011 was ordered by the Treasury Secretary to stop producing dollars for circulation — new ones are not in change or available from banks. To support collectors, the Mint introduced the four-coin sets in 2012. A handy aspect of these products is their packaging. Designed with coin collectors in mind, the dollars may be removed with ease for placement into albums or other numismatic displays. Another advantage is their convenience. 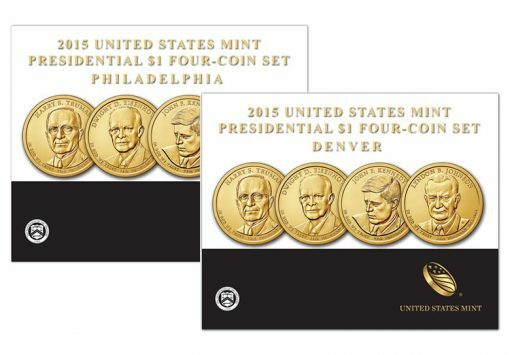 Buying both sets is good way to get 2015 P&D Presidential $1 Coins without having to make separate purchases in larger quantities and at higher prices. The U.S. Mint sells the same dollars from each facility in 25-coin rolls, 100-coin bags and 250-coin boxes at prices ranging from $32.95 to $111.95. Each four-coin set is $12.95. United States Mint products with Presidential $1 Coins are available from the agency’s website, right here, or by calling 1-800-USA-MINT (872-6468). Last year’s sets remain available. Below is a table showing the latest sales of all sets by year. Those with an asterisk (*) are sold out. Additionally, the 2013-dated set with Denver coins is currently unavailable.